Whether you are searching for a marina with a slip for your 44' cruiser or just a good place to rent a jet ski and grab a bite to eat, Lake Texoma has tons of great marinas ro choose from. 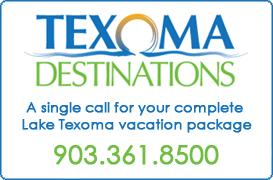 Check out the complete list of Lake Texoma marinas below and contact them directly for more information. Located a mile north and east of Gordonville, Walnut Creek Resort offers a gas dock, convenience store, wet and dry boat storage, kayak rental, mechanic on duty, full-service RV hookups, cabins w/kitchenette, A/C, and cable TV.